Believe it or not, some video games are still developed for the PC. With video games come cheat codes, and when they’re on the PC, that means using a keyboard. You can easily program any microcontroller to send a string of characters over a USB port with the touch of a button. Believe it or not, a lot of people haven’t put these two facts together. [danjovic] has, leading him to build a simple and cheap USB keystroke generator for quickly typing in cheat codes. [danjovic] is basing his build around a Digispark, a cheap, USB-enabled ATtiny85 dev board. This, of course, means there’s not a lot of pins to play with – there are only four I/O pins, and one of them is connected to ground by a LED. That leaves only three I/O pins, but [danjovic] managed to put seven different cheats in his project using diodes and something that is almost charlieplexing. If you’re wondering, this is a very inexpensive project. [danjovic] is using a Chinese digispark clone, a handful of 1N4148 diodes, and a few tact switches. Anyone with a well-stocked part drawer or a tenner on eBay could build this. If you want the proof of work for this project, you can check out the demo video below. The LaserWeb project recently released version 3, with many new features and improvements ready to give your laser cutter or engraver a serious boost in capabilities! On top of that, new 3-axis CNC support means that the door is open to having LaserWeb do for other CNC tools what it has already done for laser cutting and engraving. LaserWeb3 supports different controllers and the machines they might be connected to – whether they are home-made systems, CNC frames equipped with laser diode emitters (such as retrofitted 3D printers), or one of those affordable blue-box 40W Chinese lasers with the proprietary controller replaced by something like a SmoothieBoard. We’ve covered the LaserWeb project in the past but since then a whole lot of new development has been contributed, resulting in better performance with new features (like CNC mode) and a new UI. The newest version includes not only an improved ability to import multiple files and formats into single multi-layered jobs, but also Smoothieware Ethernet support and a job cost estimator. Performance in LaserWeb3 is currently best with Smoothieware, but you can still save and export GCODE to use it with Grbl, Marlin, EMC2, or Mach3. We recently shared a lot of great information on safe homebrew laser cutter design. Are you making your own laser cutting machine, or retrofitting an existing one? Let us know about it in the comments! There’s going to be a new Nintendo console for Christmas! It’s the NES Classic Edition. It looks like a minified NES, with weird connectors that look like the connector for the Wii Nunchuck. There are no other details. A site called “Motherboard” reports assembling a computer is too hard and a ‘nerve-wrecking [sic]’ process. Tip of the stovepipe to the Totalbiscuit. When I was in elementary school, the playground had a twenty foot tall metal slide that faced South. During my time there, at least three of my classmates fell off it, and I distinctly remember the school nurse’s aid running past me on the playground with a wheelchair. There wasn’t soft mulch or the weird rubber granules under this slide – just hard, compacted dirt. This slide was awesome, even if it was torn down when I was in third grade. [Brandon Hart]’s kid’s won’t look back fondly on their youth with experiences like these; he built a water-cooled slide in his backyard. He’s getting an 80°F ΔT with a trip to Ace Hardware, probably $20 in fittings, and a drill. Neat. This is probably better suited for an ‘Ask Hackaday’ column, but [Arsenijs] has run into a bit of a problem with his Raspberry Pi Project. He’s trying to use a planarized kernel module to obfuscate the SPI bus, but he can’t do that because of a oblivated drumble pin. He could, of course, deenumerate several of the GISP modules, but this would cause a buffer underflow and eventually wreck the entire cloudstack. I told him he should use Corrosion, but he seems dead set on his Hokey implementation. If anyone has any ideas, get the glamphs and put it on the grumbo. The Owon SDS7102 oscilloscope is a small, cheap, two-channel scope that is impressive for its price but noisier than you would expect. This scope has been thoroughly reverse engineered, and now Linux is running on this scope. This Linux scope has a working VGA display, USB host, USB device, Flash, and working Ethernet. The entire analog front end has been reversed engineered, and somehow this is now the most open oscilloscope you can buy. The ESP32 is Espressif’s followup to their very popular ESP8266 WiFi module. The ESP32 will be much more powerful and include Bluetooth when it’s released in August. Until then, [Pighixxx] has the complete pinout for the ESP32. Ever looked up in the sky and wondered where all of those planes above you were going? [Daniel Eichhorn] no longer has to, thanks to his ESP8266-based Planespotter. He built this nifty device to grab the details of the flights he sees taking off from Zurich airport. It’s a neat build, running on an ESP8266 that receives ADS-B data from ADS-B Exchange. This service allows you to query the ADS-B data with a specific location. First there were text games, then came 2D dungeons. When Wolfenstein 3D broke out on the gaming scene, it created quite a fuss. But if all you’ve got is a strip of WS2812 LEDs, those are a few dimensions too many. [treibair] has started up a project on Hackaday.io to start working on 1D video games to be played on a single LED strip. While the end application is something with a cool physical interface, probably driven by a microcontroller, prototyping is a lot easier on the big computer. He’s writing it in Processing, though, so that the transition to the Arduino is easier in the end. We think the idea is a good one, and lining up everyone’s 1D gaming experience in one place would be a great help. So link up code and reviews in the comments! Summer is now in full swing, which means that mowing the lawn once a week is starting to get old. So why not build a robot do it for you? That’s what [Blake Hodgson] did, and he’s never been happier. It only took him a couple of weeks of quality time at one of the local makerspaces. [Blake] was showing off Lawn da Vinci at this year’s Kansas City Maker Faire. He had his own booth around the corner from Hammerspace, the shop where it all came together. [Blake] started with a standard push mower from a garage sale and designed a frame around it using OnShape. The frame is made from angle iron, so it’s strong enough that he can ride on the thing. To each his own, we say. The wheels and motors came from a mobility scooter and match the beefiness of the frame. These are powered by two 12v car batteries wired in series. He drives it around his yard with an R/C airplane controller. Lawn da Vinci’s brainpower comes from two Arduino Pro Minis and a Raspberry Pi. One Arduino controls the motors and the R/C signal from the remote. The other runs some extra kill switches that keep the Lawn da Vinci out of trouble. So what’s the Raspi for? Right now, it’s for streaming video from the webcam attached to a mast on the frame back to his phone. [Blake] says he has had some latency issues with the webcam, so there could be a pair of drone racing goggles in his future. He also plans to add a GPS logger and to automate part of the mowing. Now, about those kill switches: there are several of them. You probably can’t have too many of these on a remote control spinning suburban death machine. Lawn da Vinci will stop grazing if it goes out of range of the remote or if the remote is turned off. [Blake] also wired up a dedicated kill switch to a button on the remote and a fourth one on a separate key fob. The Lawn da Vinci is one of many example projects that [Blake] uses to showcase the possibilities of KC Proto, a company he started to help local businesses realize their ideas by offering design solutions and assistance with prototyping. Between mowings, [Blake] puts the batteries on a trickle charger. 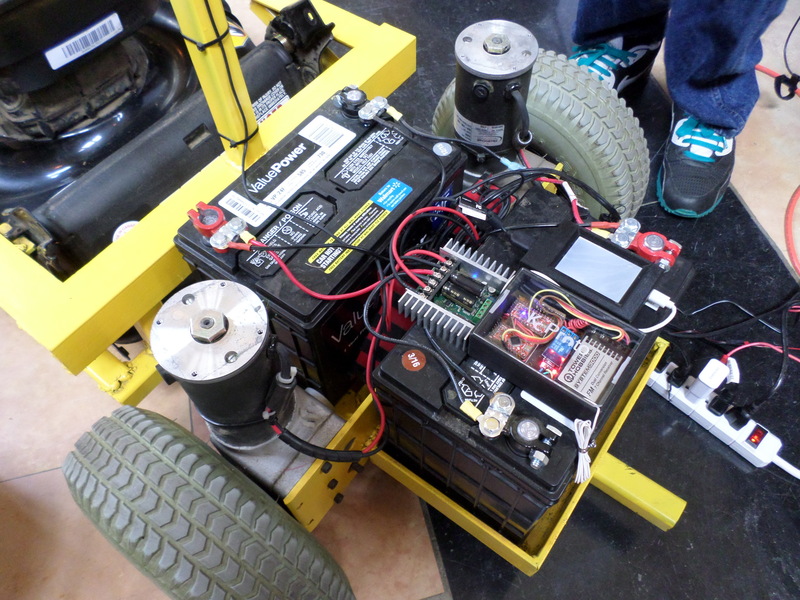 If you make your own robot lawn mower, you might consider building a gas and solar hybrid. Since the release of the Raspberry Pi, the hallowed tradition of taking game consoles, ripping all the plastic off, and stuffing the components into nice, handheld form factors has fallen off the wayside. That doesn’t mean people have stopped doing it, as [Akira]’s masterful handiwork shows us. This casemod began with a Nintendo GameCube ASCII keyboard controller, a slightly rare GameCube controller that features a full keyboard smack dab in the middle. While this keyboard controller was great for Phantasy Star Online and throwing at the TV after losing Smash, the uniqueness of this controller has outshadowed its usefulness. [Akira] began his build by ripping out the keyboard and installing a 7 inch LCD. It fits well, and makes for a very unique GameCube case mod. The rest of the build is about what you would expect – the motherboard for a PAL GameCube is stuffed inside, a quartet of 18650 batteries provide the power, and the usual mods – a memory card is soldered to the motherboard and an SD Gecko allows homebrew games and emulators to be played. The completed project is painted with the same theme as [Samus Arans]’ Varia suit, making this a one of a kind casemod that actually looks really, really good.